This dish has a very special meaning to me, it brings back memories, and it is very, very old…Only few women I have ever known have made this, and I myself don’t know the true recipe, but have recreated it to the best of my ability. I grew up in Dalmatia (yes, I’m a Dalmatian, but not one of the 101 or 102 : ) in a little village nested at the feet of mount Velebit, the largest mountain range in Croatia. Women were strong, hard working as well, blessed with new age technology, but still each house had their own smokehouse, and bread was still made old world style. One of the treasured dishes made was this “sort of cheese cornbread in fillo sort of dough”, we called it presnac. I can only remember few women ever made it, and one of them was my dad’s cousin, who sadly died last year, so I can’t get the right recipe, but I have recreated it to the best of my taste memory, and ability. It sure turned out delicious, and almost exactly how she used to make it. The only ingredient I didn’t have was good Kačkavalj cheese, which is aged semi-hard cheese, that wouldn’t lose it’s shape when baked in the dish. I know she used to layer slices of it in between fillo, and the cheese/cornmeal filling. I can find it here in the USA, only it’s a 40 minute ride, one way. Marija, you probably have it sitting in the fridge right now : ) It’s very popular in Serbia, as well as all of the Balkans. Mix all well, divide into two bowls, and add 6 Tbsp of cornmeal into one of them ---that’s for Presnac. ½ Tsp of baking powder to add later. 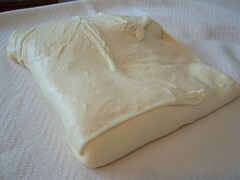 Make fillo dough, knead it well, transfer to a floured work surface, and divide into two balls. Now place the dough balls onto a clean kitchen towel, flatten them with your hands, put a Tbsp of oil on each and flatten them again to spread the oil all over the dough. 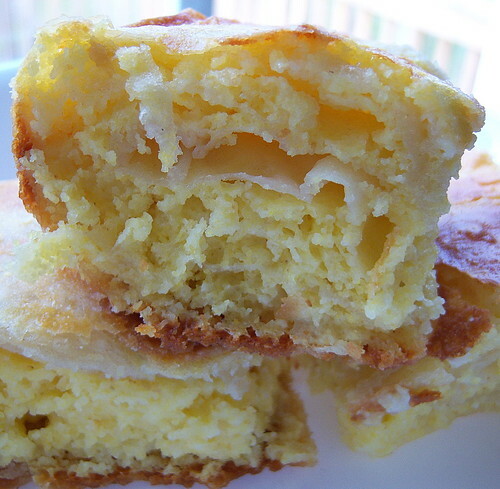 Now, mix ½ Tsp of baking powder into the cheese mixture with cornbread. 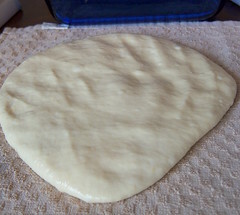 Take one dough like a pizza dough, and work the middle a bit, then place it on a clean table linen (I have one just for these dishes), and from the middle stretch it with your hands gently, and keep stretching away until it’s all done. If it starts ripping you stop. 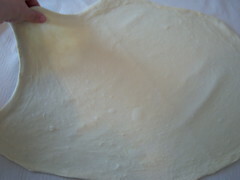 Cut off the edges, and put about a third of cheese/cornmeal filling down the middle of fillo dough. This is when you would be layering slices of hard cheese. Cover with one side of fillo, put another third of filling, cover again with other side of fillo. 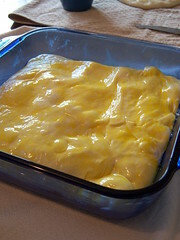 Put some more filling, and then sort of make an envelope to close it all up and form it into a baking dish shape, and transfer to an oiled baking dish, and brush with egg yolk. Bake @ 405 F for about 25mintues, then you raise the temperature to about 450 F, and bake until golden brown. It’s simple, just lift the one edge of the table linen, and let the dough start rolling itself, you might need to start with hands if it’s stuck to the linen, then you just roll away. 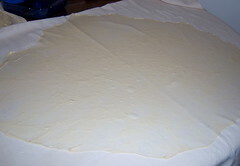 Once rolled up, you connect the edges towards the middle, like in the picture, and transfer to an oiled dish, repeat with other two thirds, and then sprinkle all with some more oil, very lightly. Bake @450Funtil golden brown. Fillo can be filled with many different fillings, like ground meat, potatoes, apples, and much more. Beautiful words, memories and dish! Lovely.....what your wrote about memories and this memorable dish from your childhood! These recipes+stories are a wonderful tradition to pass on to your family & friends alike. Wow this looks delicious! I love recipes with a story. Beautiful story, it reminded me of my Mother's, she was born in Lika. And you made fillo dough yourself! It takes a lot of skill for that! 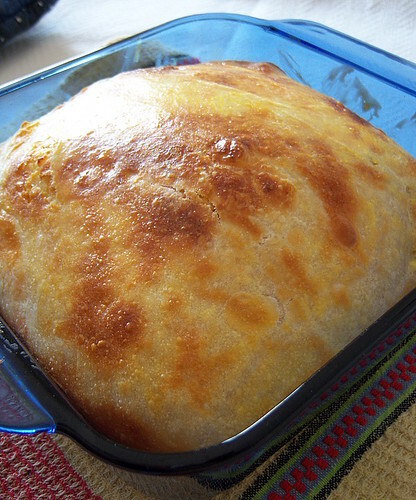 Medena, what a great recipe! I will make it!!! 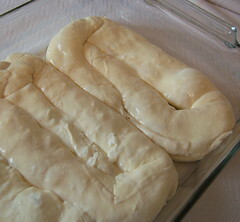 Wow, phyllo dough on your own?? You are amazing. 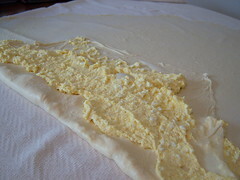 I think I will use a ready phyllo dough they sell in the market. For all you do and for your amazing talent you just received an award from me. Check out my blog! You are amazing that you can recreate something based on memory of taste! I love it!!! What a tribute to your cousin. I love how you write your blog and how original you are. This recipe looks delicious! Thank you HoneyB! Such a nice comment! I like your blog for its warmth, love, and your life stories attached to your recipes! What a delight to find your blog. I found via your friend Marija's mention of your beautiful eggs, and they are! They remind me of my time spent working in Slovenia and their red and black eggs as well. I had something similar to this in Slovenia and I love you r description of Croatia. I would agree with you completely in your description of your people and of growing up there. That was my impression of Slovenia and Croatia and their people. It was a special time in my life and I have very fond memories of that time. Thank you for your story and recipe. Bless you, medena! My husband is Croatian, and we both love the pita his mother makes when we visit her in Chicago. I know how to do the filling, but I haven't been able to find the right pastry and every recipe I've found has been a disaster. Yours looks right on the money. I'm off to the kitchen now...and THANK YOU! Zaista predivan post i predivan recept. Dopada mi se nacin na koji prezentiras svoju kuhinju Amerikancima (i svijetu). Cestitke na krasnom blogu, predivnim fotkama i lijepom izboru prikazanih jela. I would like to email you but your email link isn't working. 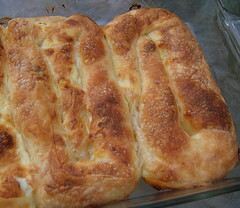 I love your pita recipe, and will be posting a link on my blog.